Here at Fether Hardwoods we also produce custom trim and moldings, including but not limited too, Casings, Baseboard, Chair rail, Hand Rails, Wainscoating, Tongue and groove paneling, Crown Moldings, Plinth blocks, Rossettes, Window sills, Stair treads, risers, just about everything you will need for your next interior project wether it be new construction or a remodel. We have a large stock of patterns at our facility for you to choose from, if you don't see what you are looking for we will gladly make a knife to your liking. 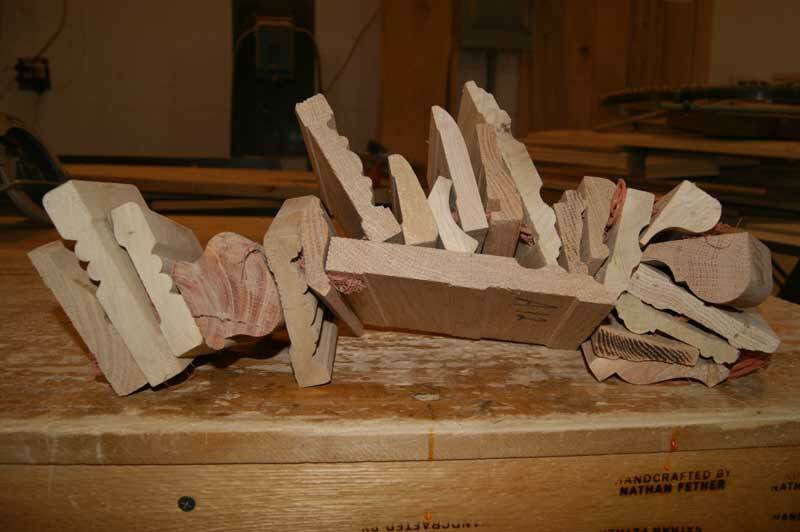 If you are trying to reproduce an existing molding all we need is a template of the original, a traceing, or better yet a scrap piece that we can make the knife to fit to for a perfect match. We also produce hardwood flooring in widths up to 8'' and in any species you would like, or as many customers wish to do now in a mixed species. Call or contact us on-line for all your Trim and Molding needs.